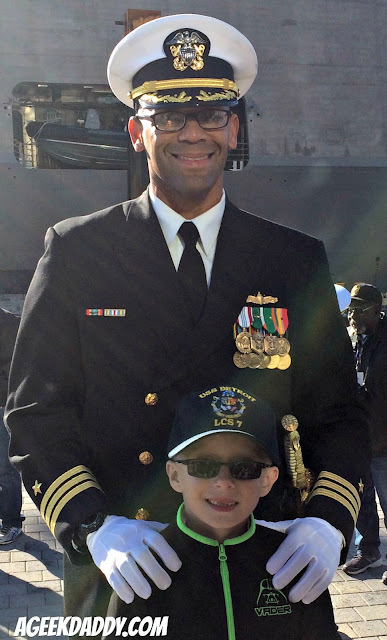 My son and I had the opportunity to attend the Commissioning Ceremony for the U.S. Navy's newest ship, the USS DETROIT, at an event on Saturday, October 22, 2016 that featured the vessel docked along the riverfront of its namesake city. 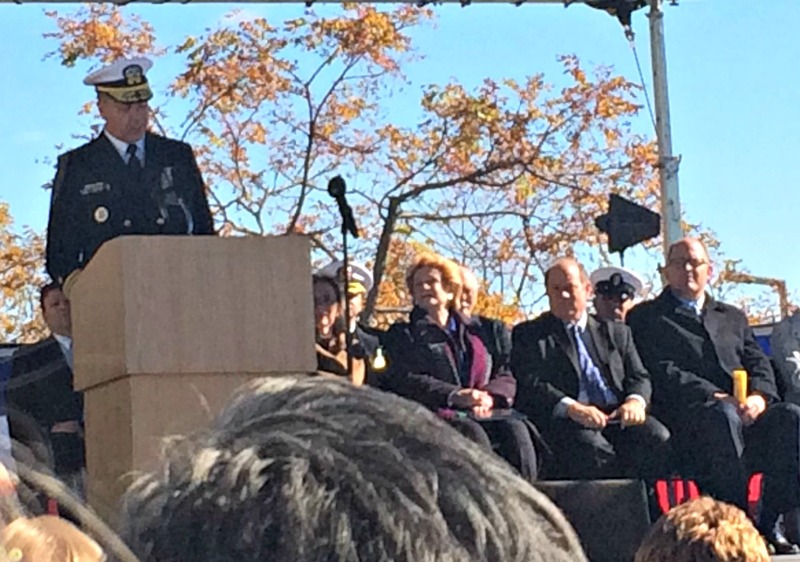 It is not very often that a naval vessel is commissioned at a city when it is named after one so this was a special moment. Coming from a family filled with Annapolis grads and Navy veterans that has roots to Detroit dating back to the city's earliest French settlers it really was a memorable experience to be a part of. 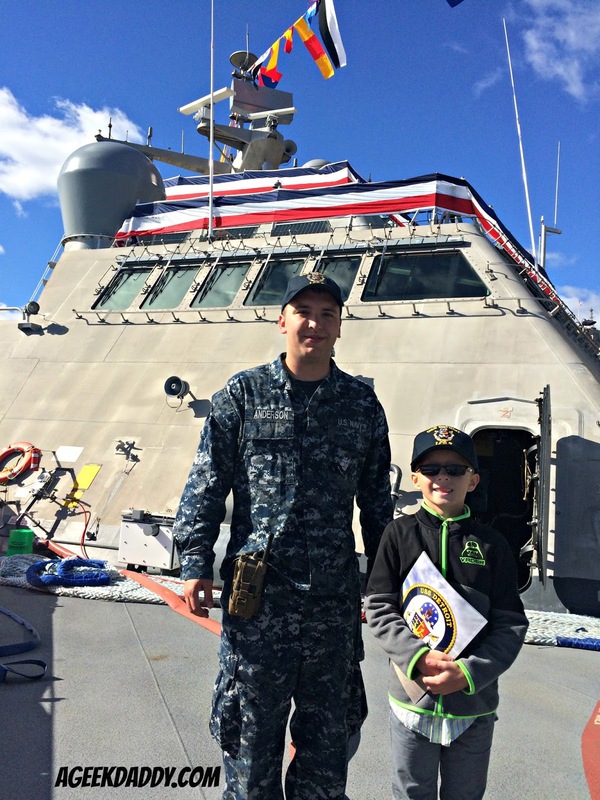 After the official commissioning ceremony which included presentations by public officials and Naval officers along with a gun salute, raising of the Colors over the ship, and the playing of Anchors Away concluded, we had a chance to tour the ship. 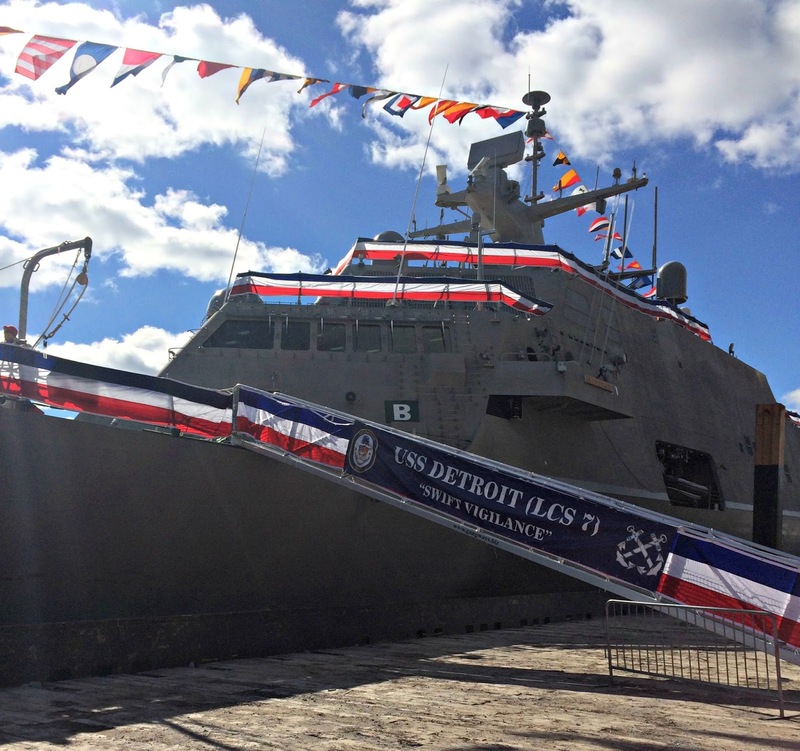 The USS DETROIT is meant to be versatile (it can sail into waters as shallow as 14 feet deep) and fast (reaching speeds of 40+ knots) option allowing the Navy to operate in waters traditional warships have been too large to engage in throughout the world. Whether it is assisting allies in preserving their territorial interests around the shoals of the South China Sea, protecting shipping from pirates in the international waters off the coast of Somalia, or providing humanitarian aid to hurricane ravaged communities in the Caribbean and South America, the USS DETROIT is ready to serve the interests of the United States wherever it is needed around the globe. 387 feet long this 3,480 ton ship is propelled by 4 water jets powered by 2 Rolls-Royce gas turbines. Instead of being pushed along by old-school turbines this new ship zips along like a super-sized jet sky that also happens to be armed with with a BAE Systems MK 100 57 mm canon, 2 Mk44 Bushmaster II 30 mm guns, 6 .50-cal machines guns and 21 RIM-116 Rolling Airframe Surface-to-Air Missiles. It also can carry up to two Seahawk helicopters or a variety of unmanned airborne, waterborne, or undersea drones to assist with missions. 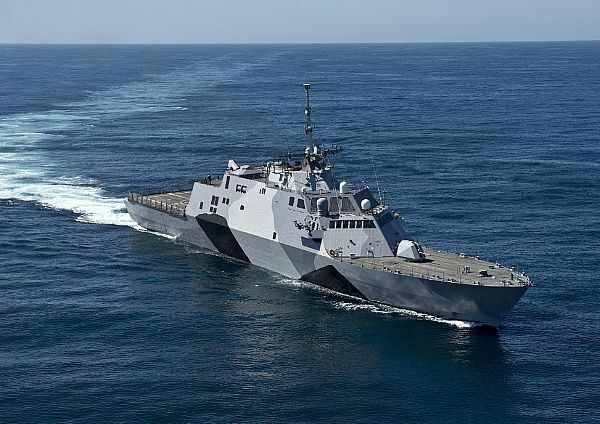 Classified as a Littoral Combat Ship, which it means the ship operates close to shore in what is called the littoral zone, the USS Detroit has the flexibility to be used for a variety of missions with a core crew of 50 that can be expanded based upon necessity up to 75. We had the chance to meet the USS DETROIT'S Executive Officer, who is second in command of the ship. During our conversation, he explained to us the symbolism of the vessel's coat of arms. Each ship in the Navy's fleet has its own personalized badge and it was very interesting to learn about the symbolism invoked in the one created for USS DETROIT -- LCS 7. SHIELD: The background provides a partial depiction of the flag of the City of Detroit. The yellow trident displaying lightning symbolizes the modern power of today's Navy. The winged tire recalls Detroit's long-time connections to the automotive industry. 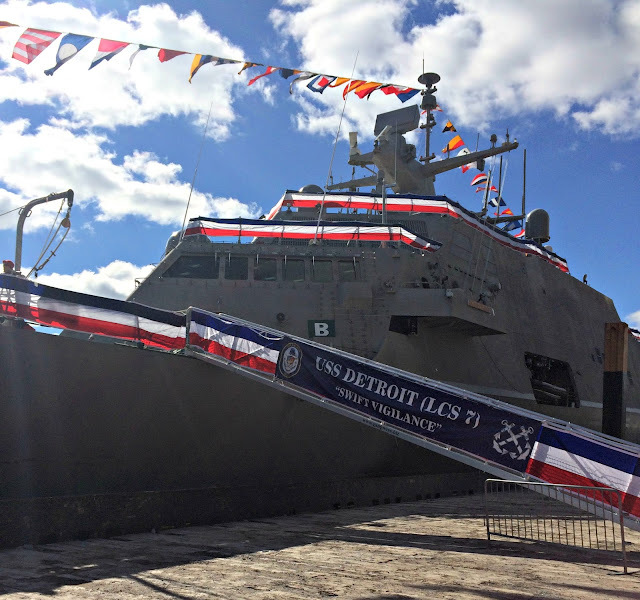 The crossed Officer's sword with an Enlisted Chief Petty Officer's cutlass symbolize teamwork and readiness plus highlight the experienced crew of the USS DETROIT LCS 7. 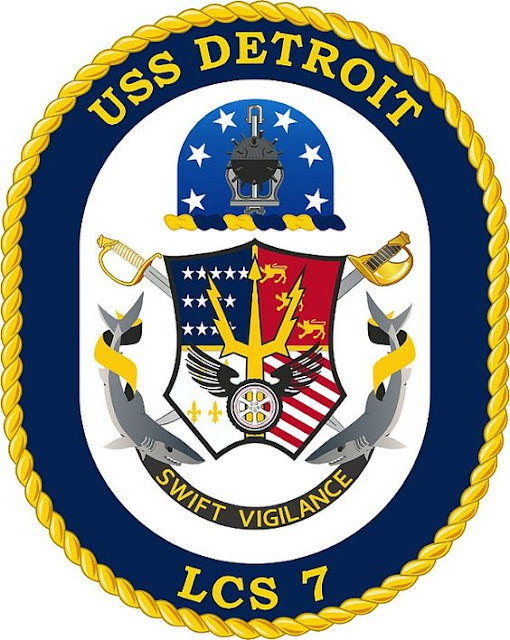 CREST: The array of stars signifies that this is the sixth ship named for the City of Detroit in the history of the Navy. The contemporary anchor represents this ship is in the modern Navy while the mine demonstrates its substantial underwater warfare capabilities. MOTTO: Black represents the color of might and determination; yellow signifies the four virtues of nobleness, goodwill, vigor and magnanimity. 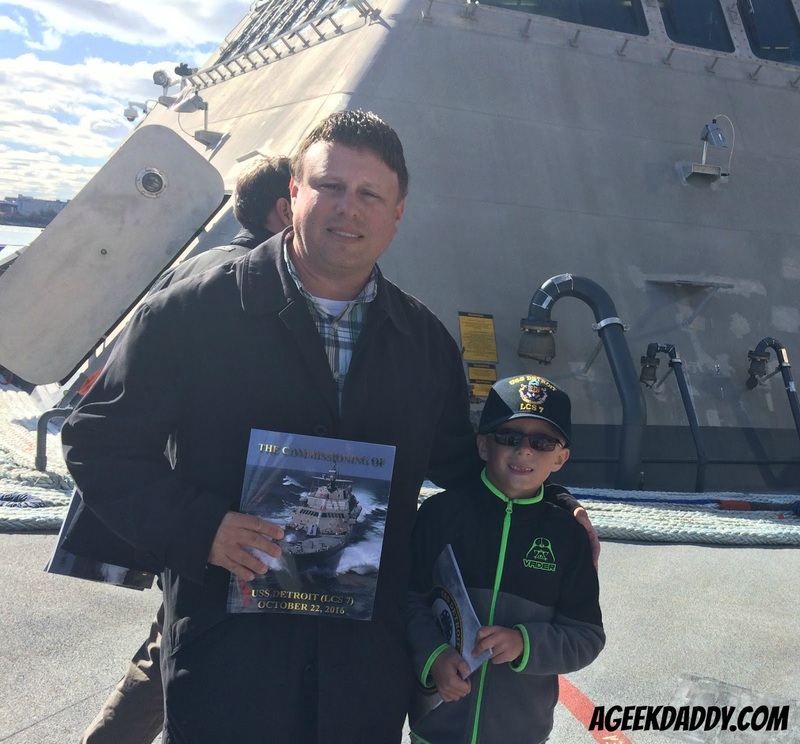 The motto, "SWIFT VIGILANCE" and shark illustrations demonstrate the speed, preparedness, and perseverance required for a Littoral Combat Ship.